Houston Golf News, Houston Golf Lessons, Golf Interviews, and everything golf. Golf, in fact, has a long history in the Arizona desert – a longer history than Arizona itself. Determined settlers in the late 1800’s were willing to leave their homelands, friends and families behind – but not their hickory-shafted clubs and gutta-percha balls. By train and wagon they came, hauling all their worldly goods with their golf bags strapped across their backs, in search of turf to call their own. Who can claim the first golf course is up for a debate hotter than a tin roof in Tucson in July, but the Phoenix Country Club dug nine holes in dirt fairways and sand “greens” as early as 1899. The first official golf tournament was held 12 years before Arizona became a state. It’s hard to imagine that the same territory that hosted the sharp-spurred, trigger-happy miscreants of the O.K. Corral also saw men in knickerbockers and waistcoats aiming very different kinds of shots. The love of golf, against all odds and all climates, is deeply ingrained in Arizona, and with the advent of irrigation has given birth to extraordinary results. The Fairmont Princess resort is one of them. While calling the acres of lush lawn, ponds and pools of The Fairmont Princess and the TPC Scottsdale golf courses a “desert oasis” is an unforgivable cliché, few other words capture what it’s like to find so much beauty (and water) after miles of bone-dry land. Last week, I had the chance to “stay and play” at TPC Scottsdale and the Fairmont Princess – a resort that balances modern, clean lines with desert-inspired décor – for some R&R, golfer-style. From the moment I stepped onto the complex, I was impressed as much by the looks of the sprawling resort as by the staff’s hospitality. After a tour-by-golf-cart, necessary transportation for exploring the grounds, I attempted to count all the possible activities that could easily fill my days and nights: Three extravagant pools with assorted waterslides, hot tubs, bars, and massaging waterfalls; two well-equipped gyms; function hall rooms for special events; a well-appointed spa; and a world class steak house serving southwestern cuisine (along with a Starbucks and two American-style restaurants). I was also informed that the man-made pond I saw from my balcony was stocked with fish, and a fishing rod could be provided on request. However, like the Arizona settlers before me, I sought only one recreation: Golf. As much golf as I could pack into my brief stay. But, I did look forward to working out the kinks from long hours on the greens under one of those massaging waterfalls. The sheer amount of greenery on the property is astounding – and the greens today are genuine grass, not the sand of olden days (I can’t imagine what it must have been like to try to putt in what was, essentially, a dressed-up sand trap). In the Arizona desert, water is hard-won, but even during the dust-bowl of 1933-34, in the middle of the Great Depression, there was golf. The Turquoise Valley course near the Mexican border, built in 1936 by the Works Progress Administration, is the oldest continuously operating course in the state. In an early take on the two-for-one deal, golfers could begin their day with 9-holes on the Turquoise Valley course, and finish their game with 9-holes in nearby Warren. There may have been lines for bread during that decade, but that didn’t stop tee-time. A similar course share-program can be found today between the Princess TPC Scottsdale. The Fairmont Princess occupies the same expanse of well-watered grass as the TPC Scottsdale Stadium and Champions courses. If two courses within walking distance weren’t enough, the Princess also offers a putting green on the second floor overlooking the pool – ideal for a little night putting. Both the Stadium and Champions courses are strikingly lush against the desiccated backdrop of the nearby hills. The greens at the Stadium roll fast and true, which allowed me to accurately predict success or failure the moment my putter met the ball. While the pristine fairways are generous, giving the ball some extra momentum, I soon discovered that when I hit wide, the rough became downright rugged. If my strokes had landed too far off of the map, I could easily picture my golf ball playing Plinko between hard-packed dirt, rocks and cactus. This added some entertaining challenges to the game, but it was unsettling to wonder whether my ball would land in a playable spot, or on top of a rudely awakened rattle snake. No snakes were seen, though I did spot both a coyote and a road runner. As the host course of the Waste Management Phoenix Open, the 16th hole at TPC Scottsdale’s Stadium course has been photographed thousands of times, and the famous hole did not disappoint. But while I could have happily putted on the Stadium’s smooth greens all day, the Champions course was one of the true highlights of my stay. I appreciated the increased difficulty and the more local feel of the desert terrain punctuated with man-made ponds. Whereas the Stadium course has flawless turf, the Champions course melts seamlessly into the Arizona landscape, feeling like the culmination of the hopes of one hundred years of dauntless desert golfers. After a full day out on the range, I knew I had both a thick, juicy steak and a waterfall-Jacuzzi to look forward to – more than my Arizona golfing forefathers ever could have hoped for. Now that I’m home, I’m already picturing a return trip with friends. 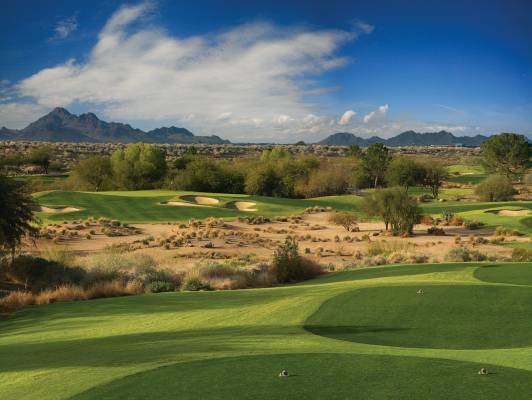 TPC Scottsdale and its neighboring courses have something for everyone and accommodate golfers of all skill levels. In fact, golfers and their non-putting friends and family will be very happy with a stay here – I know I was.